When the yellow flag hits the turf in an NFL football game, you know somebody has broken the rules. However, understanding exactly what's gone wrong can be a little bewildering. Football sometimes seems like a game of contradictions and intentionally confusing terminology. 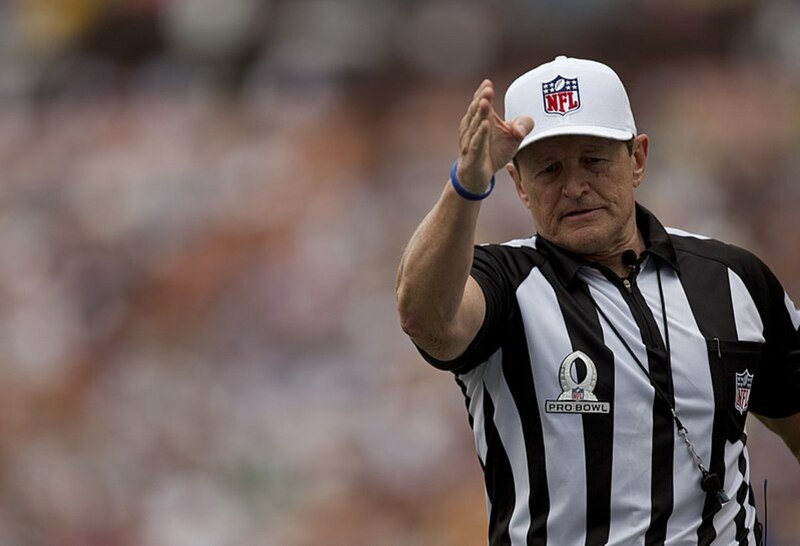 There are seven officials in NFL football who are responsible for calling fouls and enforcing penalties, and they take a lot of heat. Though we commonly call them referees, only one of them actually bears that title. The others are the Line Judge, Back Judge, Field Judge, Side Judge, Umpire, and Down Judge (formerly called Head Linesman). The Referee is the leader of the bunch, and can be distinguished from the others by his white cap. Each official has specific responsibilities as far as what to look for during a given play. Even though it might seem like they miss a lot when your team is getting the short end of the stick, it's amazing how much of this fast-moving game these guys are able to monitor, and how accurate they are. 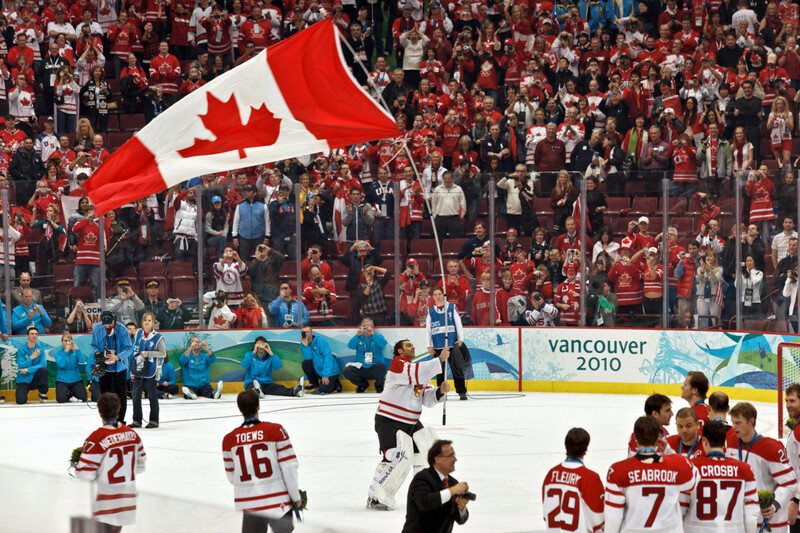 Penalties can make or break a team, so avoiding them is paramount to success. Fouls in football can result in losing yards on the field, losing downs, or, in extreme circumstances, even a player’s ejection from the game. 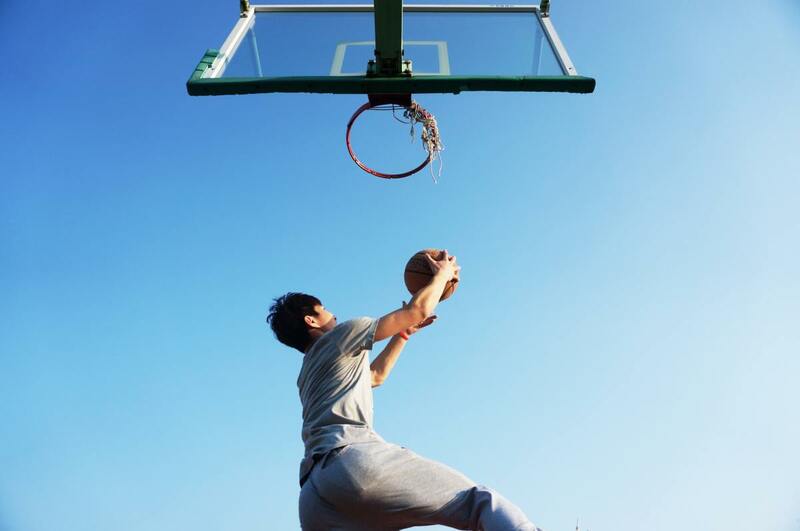 Players do not accumulate penalties as in basketball or other sports, but the impact of each infraction is imposed on the team as a whole. Players are only ejected if a singular act violates the rules very severely, such as kicking or punching another player or intentionally contacting an official. 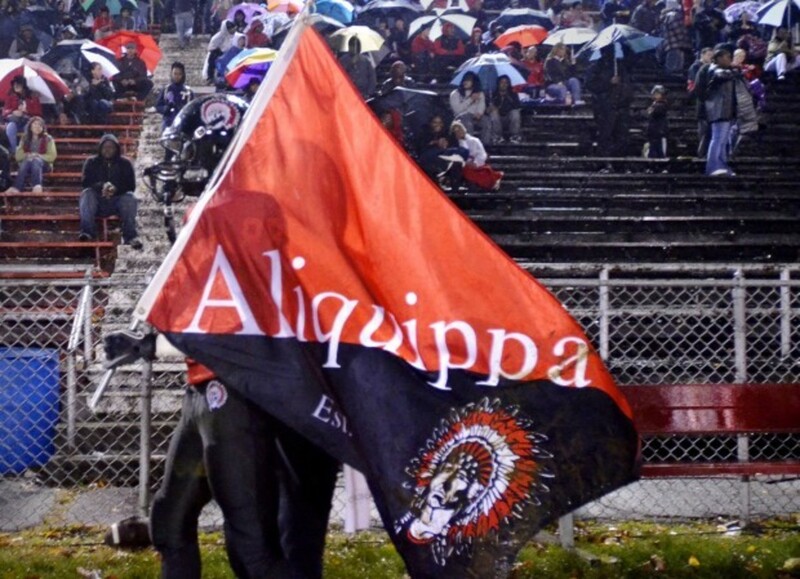 Still, even though fights and scuffles occur frequently, ejections are rare in football. The officials, and the leagues, would much rather see the game settled on the field and not because a key player got the boot. Penalties in football usually mean yardage gained or lost in one direction or the other. In the NFL, this means it can be five, ten, or fifteen yards, dependant on the foul. It may also mean the loss of a down if the penalty is committed by the offensive team. In some cases, odd yardage amounts may be awarded, such as infractions near either goal line where the full yardage can’t be applied. Personal fouls are a special class of penalty made up of the most severe infractions, and therefore call for the strictest enforcement. This may include an ejection. In the most egregious cases, the player will also be fined by the league. Usually, the penalty is enforced from the previous spot of the ball, but that isn’t always the case. Spot fouls are enforced from the on-field location where the penalty occurred. In special cases, such as defensive pass interference, this may add up to huge yardage. Dead-ball fouls occur when a play is not in progress. These are often unsportsmanlike conduct penalties or personal fouls related to player (or coach) behavior. They are enforced from the spot of the ball, and the previous play counts. While penalties committed by the offensive team in their own backfield are typically enforced from the previous line of scrimmage, fouls they commit in their own end zone result in a safety. This means two points for the opposing team, plus possession via free kick. Defensive penalties occurring on the last play before the end of a half result in an untimed down for the offense. This is essentially a free play. In recent years the NFL has implemented safety-oriented penalties under the umbrella category of unnecessary roughness. These involve making helmet-to-helmet contact during a tackle as well players lowering their head when making a hit. These infractions carry with them the possibility of an ejection and a fine. 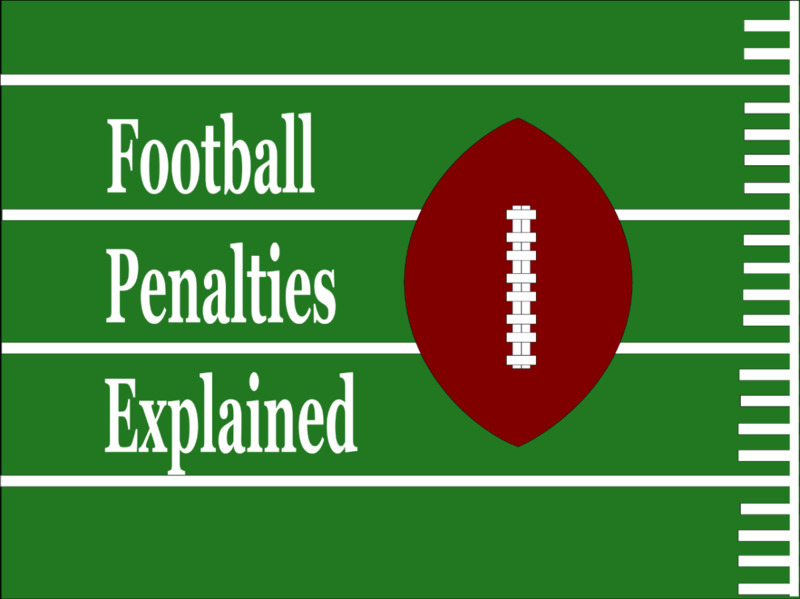 What follows is a basic list of the most common penalties in NFL football, explained as simply as possible. If you can understand these infractions, you’ll be able to follow along when that yellow flag comes out. Unless otherwise noted, these penalties are enforced from the previous spot of the ball. 15 yards, plus an automatic first down if committed by defense. Clipping is the act of contacting a player who is not a runner from behind and below the waist. It most commonly occurs when an offensive player attempts to block a defense player at the legs from behind. When an offensive player is engaged with a defender, a second offensive player may not contact that defender below the waist. This is not only illegal, but seen as a cheap shot by many players. The game is governed not only by the game clock, but by a 40-second play clock that counts down the time the offense has before they must run the next play. If the play clock strikes zero and the play hasn’t started, the quarterback gets a delay of game penalty. Defensive offside, when a defensive player is in violation of the neutral zone at the snap. This term is usually used when the defensive player makes contact with an offensive player. A player may not grab an opponent's facemask or any area of his helmet. Offensive linemen are not eligible to run downfield and receive passes, and the numbers they wear on their jerseys make this clear to officials. However, sometimes a lineman may line up in an eligible position, and if he plans to do so he or the coach must report this to the officials. Failure to do this results in a penalty. When an offensive player on the line moves before the snap, or when an offensive player in the backfield moves forward before the snap. 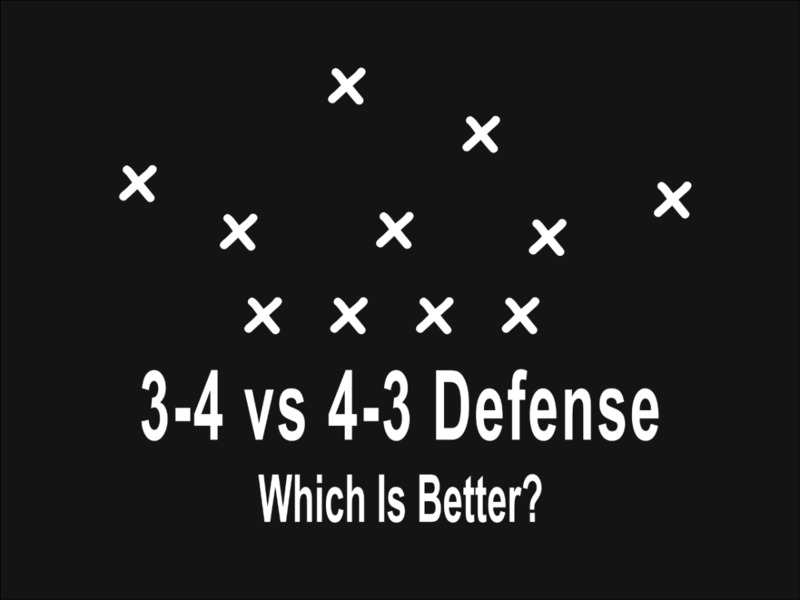 10 yard if committed by offense; 5 yards plus automatic first down if committed by defense. An offensive player can’t grab a defensive player while trying to block him. A defensive player may not grab or impede an offensive player, other than the ball carrier. 15 yards, plus an automatic first down. A player may not tackle a ball carrier from behind by grabbing the back of his collar or the edge of his shoulder pads and pulling him to the turf. Offensive players may not block defensive players from behind. The exception to this is if they maintain continuous legal contact with a defensive player as he turns around. The offense must line up with 7 men on the line of scrimmage. If they fail to do so it is an illegal formation. 5 yards from the spot of the foul, plus loss of down. This is called when the quarterback throws a pass after running beyond the line of scrimmage, or when more than one forward pass is thrown on the same play. Can a quarterback receive his own pass? 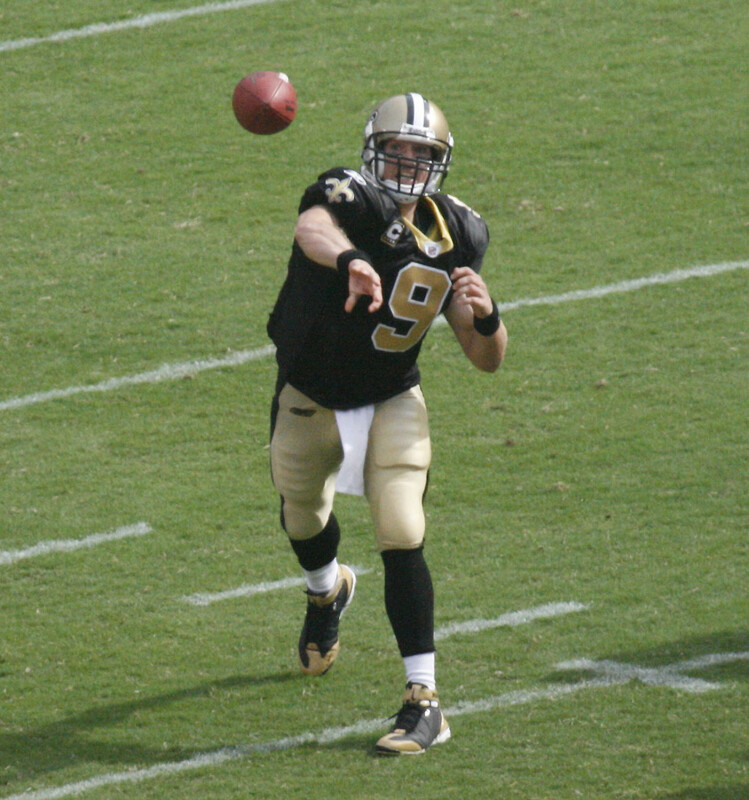 In the NFL, the quarterback can receive his own pass if it is batted back to him. However, he becomes a runner at that point, and may not attempt another forward pass on the same play. 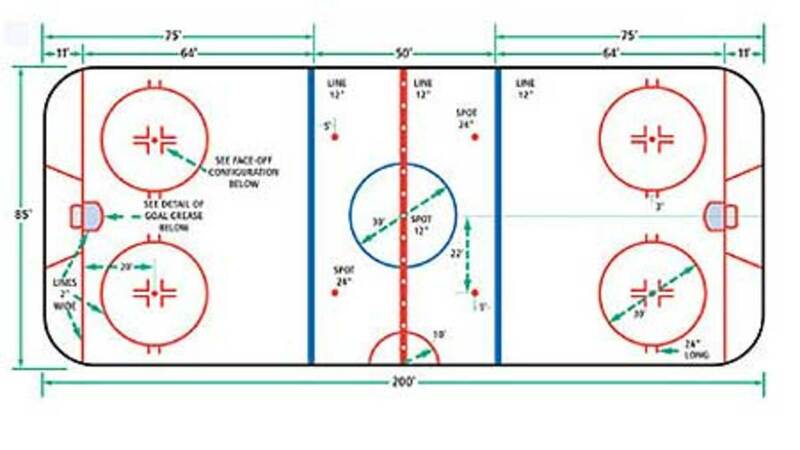 Similar penalties involving the improper movement of offensive players. 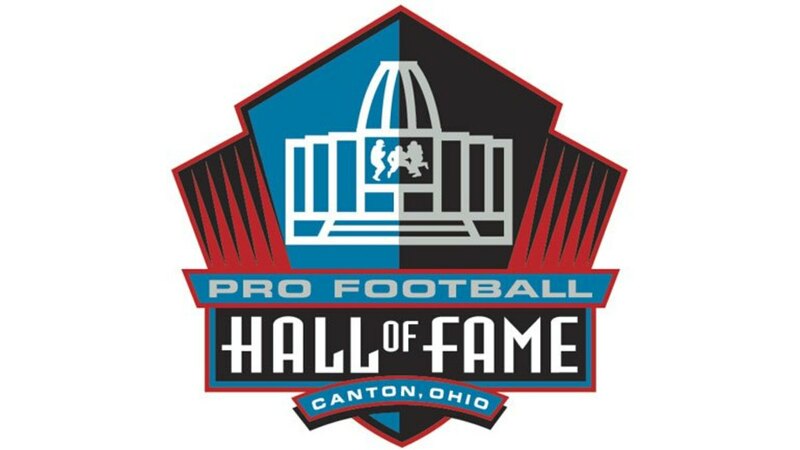 Offensive players may only move around before the snap by a very specific set of rules, and only one player may be moving laterally to the line of scrimmage when the ball is snapped. Football is played with eleven men on a side at a time, and having more, of course, means a penalty. There are a lot of substitutions in football, so players are running on and off the field between plays all the time. But offensive teams are also not allowed to break the huddle with more than 11 players, nor may they have more than 11 men in the huddle. This is illegal substitution. If a play is run with either team having 12 or more men on the field, the penalty is Illegal Participation. This is a blanket penalty for any contact with the ball by an ineligible player. 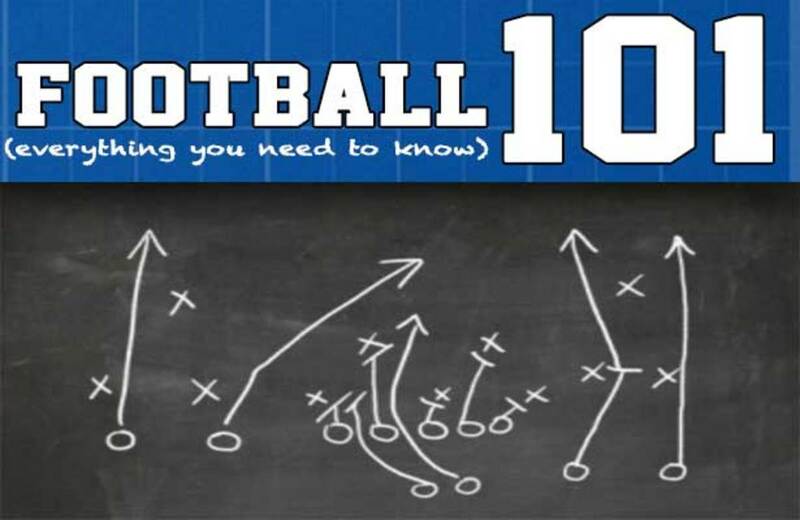 This includes an interior lineman who touches a forward pass, a player who goes out of bounds then comes back in and is the first man to touch the football, or when the kicking team touches the ball before it goes ten yards after a kickoff. 10 yards against the offense; 5 yards plus automatic first down against the defense. The five offensive linemen are not allowed to run downfield on passing plays. They are ineligible, and will be penalized if they leave the line of scrimmage before the pass is thrown. 10 yards or spot of foul, plus loss of down. When the quarterback is about to be sacked he can’t just fling the ball away. He has to be outside of where the tackles line up, there must be a receiver in the area and/or he must throw the ball past the line of scrimmage. Otherwise, it’s intentional grounding. A defensive player may violate the neutral zone before the snap, as long as he gets back before the ball is snapped. However, if his action causes an offensive player to move, this penalty is called on the defensive player. 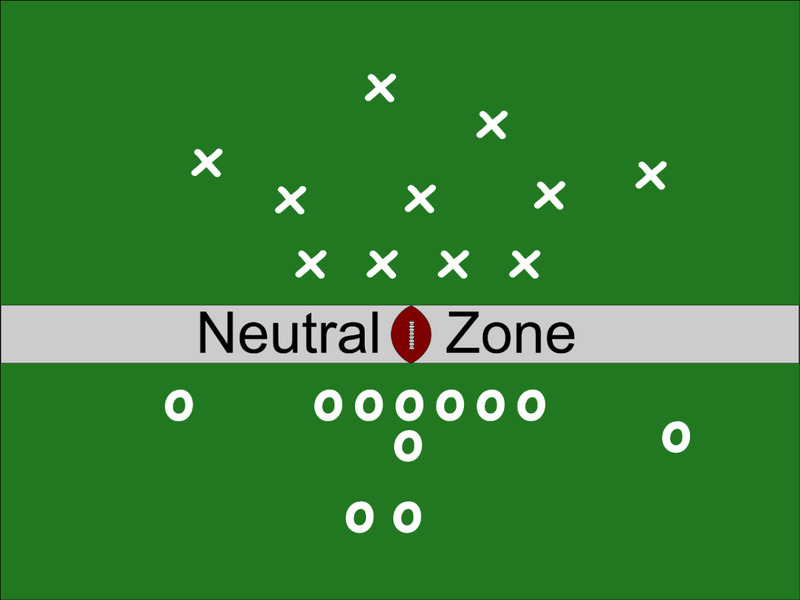 The Neutral Zone is a space the length of the football that runs from sideline to sideline. A general term for when one team has moved across the line before the start of a play. Enforced at the spot of the foul if committed by defense. 10-yard penalty if committed by offense. When a forward pass is thrown, both the offensive and defensive players have the right to catch the football. But once the ball is airborne a player may not interfere with another player to impede him from getting to the football. Sometimes players accidentally run into each other, which is called incidental contact and not a penalty. 15 yards plus automatic first down. Both the quarterback (passer) and the kicker/punter are protected by the rules when they are in the act of passing or kicking. A defensive player may legally hit them only if they have the ball, or, in the case of the quarterback, for a very short time afterward. Otherwise, it’s a 15-yard personal foul for roughing. Less severe than roughing the kicker, this occurs when the offending player bumps the kicker or punter but doesn’t intentionally hit him hard. Still, a defender can’t touch the kicker, and so it’s a penalty. 10 yards, automatic first down if committed by defense. No player may trip the ball carrier, or any other player for that matter. Offensive linemen who find themselves out of position when trying to make a block sometimes employ a special type of tripping called a leg whip. Sometimes they get away with it, and sometimes they don't. 15 yards, automatic first down if committed by defense. Football is a rough game, but any physical contact outside the boundaries of the rules is deemed unnecessary roughness, carries a 15-year personal foul penalty, and has the possibility of getting a player ejected. This includes late hits after the whistle blows, scuffling after a play or tackling a player who has run out of bounds. 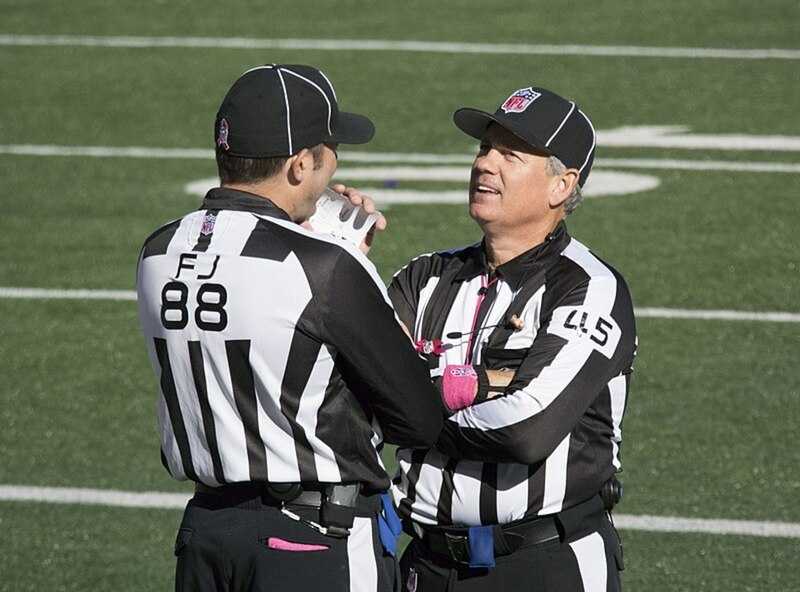 A broad term for an array of personal foul infractions a player might commit against the spirit of the game. This includes taunting another player, kicking the ball after the play is over, or abusive language to an official or other player. Penalties can change the outcome of a football game for sure, but the best officials know how to balance calling a tight game with letting the players sort things out on the field for themselves. Especially in the NFL, where players execute on such a high level, there is no desire on the part of the league, the officials, the fans or anyone else to let penalties dictate the game. In the best situations the officials fade into the background. No matter what the officials do, they’ll always be the target of the fans. It’s a tough job but, as they say, somebody has to do it. But the most intelligent fans appreciate the work of a good NFL football official, even if they don’t quite see the same holding penalty as the guys in the stripes. @John - Intentionally punching another player is a personal foul that typically leads to an ejection. Punching at the ball (not the player) is a legal way to get a ball carrier to fumble. As for what really goes on with the Patriots I'll leave that to the imagination. You failed to mention Punching as seen in Seattle Games when they punch you in the stomach to make you fumble the ball! i saw this several times, even in the Superbowl! No penalties were called! Patriots are guilty of these game changing lack of penalties.